Looking for an easy snack or the perfect Game Day offering? Look no further! These 10 Minute Vegan Chili Cheese Nachos are what dreams are made of. They’re cheesy, salty, savory, and delicious. Even your non-vegan friends and family will devour these in less time it takes to make them, rest assured. My favorite part about these Vegan Chili Cheese Nachos is hands down the easy Vegan Queso. It takes less than 5 minutes to make and this recipe makes extra. Keep it in the fridge and put it on everything. You won’t regret it. What can’t cashews do, am I right? Back to the nachos. They are insanely delicious. I’m a huge fan of vegan chili, but combining it with vegan queso and throwing it on top of some blue corn chips? That was a stroke of genius I had at 1am one night when I was hungry and just a teensy bit tipsy. Don’t all good ideas come then? Vegan Chili and 5 Minute Easy Vegan Queso come together to make the most delicious easy snack. 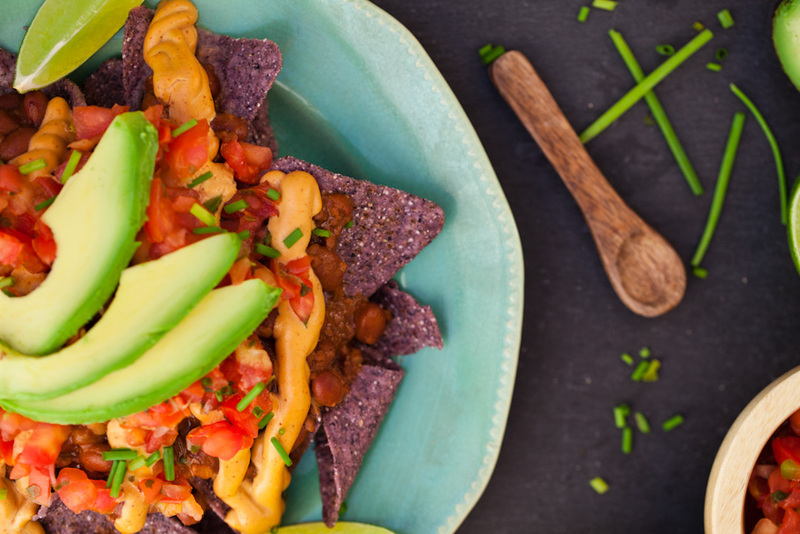 These Vegan Chili Cheese Nachos are perfect for game day or a simple dinner. Boil the cashews for ten minutes to soften, then drain. Combine cashews and all other ingredients in a high powered blender. Blend for 2-3 minutes until smooth, stopping occasionally to scrape down the sides. Store in an airtight container in the fridge for up to 5 days. Heat the vegan chili in a saucepan until hot. Spread the blue corn chips onto a large pan or two large plates. Spoon the chili over the chips, then drizzle the vegan queso over the chili. Finish with pico de gallo and avocado to garnish. Recipe makes 1 large pan or 2 large plates of nachos. There will be leftover vegan queso. This recipe is heavy on nutritional yeast. For a milder cheesy flavor, use a bit less. The queso will be fairly warm from using boiled cashews. It will stay hotter if you use room temperature salsa. If you prefer it hotter, simply warm the queso in a sauce pan before putting it on the nachos. To make the queso in 5 minutes, keep soaked and drained cashews on hand in your freezer. To make the queso raw, soak the cashews for 2 hours or overnight instead of boiling them and use raw pico de gallo in place of salsa. My husband and I devoured these Vegan Chili Cheese Nachos like we hadn’t eaten in days, but if you bring them to a party where people have better table manners than us, this recipe can serve up to four people. Just look at that dip! This Vegan Queso tastes incredible. It’s creamy, cheesy, and just a little bit spicy. It’s the perfect topping for these Vegan Chili Cheese Nachos, and for pretty much every other savory food I can think of. For more deliciously cheesy vegan recipes, check out our 20 Minute Vegan Quesadillas and our Easy Vegan Green Enchiladas! Did you try this recipe? Leave us a comment below and tell us about it! While you’re at it, post a photo of your Vegan Chili Cheese Nachos to Instagram with the tag #carrotsandflowers so we can admire your handiwork! And don’t forget to share this recipe with your friends so they can make insanely delicious Vegan Chili Cheese nachos too. Watch this video to see how easy it is to ditch dairy and make your own vegan nacho cheese! Thanks for this fantastic recipe. I LOVE the fact that it only takes 10 minutes – that’s the REAL selling point! I’ve share this with my FB group called “Super Quick Plant-Based Recipes’ – as we LOVE recipes that take 20 min or less to prepare! What is the quantity of cashews needed for the queso part of this recipe? Is it a full cup? What a silly mistake, thanks for catching that! The amount is 1 cup. I’m updating the recipe now. Thanks again!